Fellowship Previews: Titan Comics Announce New Partnership With Hammer! Titan Comics Announce New Partnership With Hammer! 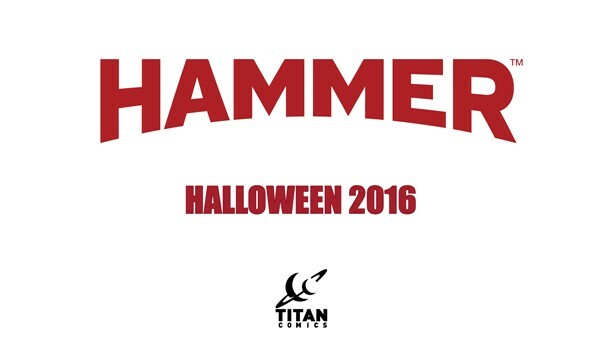 Beginning this Halloween 2016, Titan Comics is thrilled to announce it will team up with world-renowned Hammer to breathe new life into some of their iconic characters. Founded in 1934, the legendary British studio Hammer Films produced hundreds of motion pictures across many genres including science fiction, psychological and supernatural thrillers, films noir and even historical epics. However, the famous brand gained its worldwide reputation – and became hugely impactful across popular culture – with an array of now-classic gothic horror films including The Quatermass Experiment, The Gorgon, The Devil Rides Out, and a string of motion pictures featuring iconic monsters Frankenstein, The Mummy andDracula; the latter of which made its stars Christopher Lee and Peter Cushing into household names. The quintessentially British Gothic aesthetic of these Hammer films, went on to inspire generations of filmmakers including Roger Corman,Tim Burton and Guillermo Del Toro, has left such an imprint on the genre that the term "Hammer Horror" became shorthand for a visual style consisting of creepy castles and boiling blood! Since its rebirth in 2008, Hammer’s new film output has included the worldwide box office smash The Woman in Black and its sequel The Woman in Black: Angel of Death – a global franchise born from Susan Hill’s celebrated gothic novella – as well as the critically lauded vampire film Let Me In, and folk horror Wake Wood, as well as the paranormal thriller The Quiet Ones. Announced at ComicsPRO retailer summit in Portland, Oregon, the partnership will see the publication of brand-new comic stories featuring classic Hammer properties, as well as wholly original Hammer stories, produced by Titan. Editor David Leach said, "at Titan Comics we're howling at the moon over this bold new collaboration! Hammer is the home of some of the most groundbreaking horror and genre films in motion picture history. Together we're going to make some terrifyingly good comics." Fittingly, the creators and properties involved are still wreathed in shadow, and those interested in further news and developments on the initiative should join Titan Comics on Facebook, Twitter or Tumblr.